I received a beautiful pot of succulents for Christmas and gave it all kinds of tender, loving care. In spite of my efforts, it developed a spot in the middle and no matter what I did to revive the middle plants, the bare space in the middle increased. As you can see from the headline photo, I soon discovered the culprit! My husband has now added some new plants for the empty space with a promise to go with cacti if that doesn’t stop Fresh, the cat! 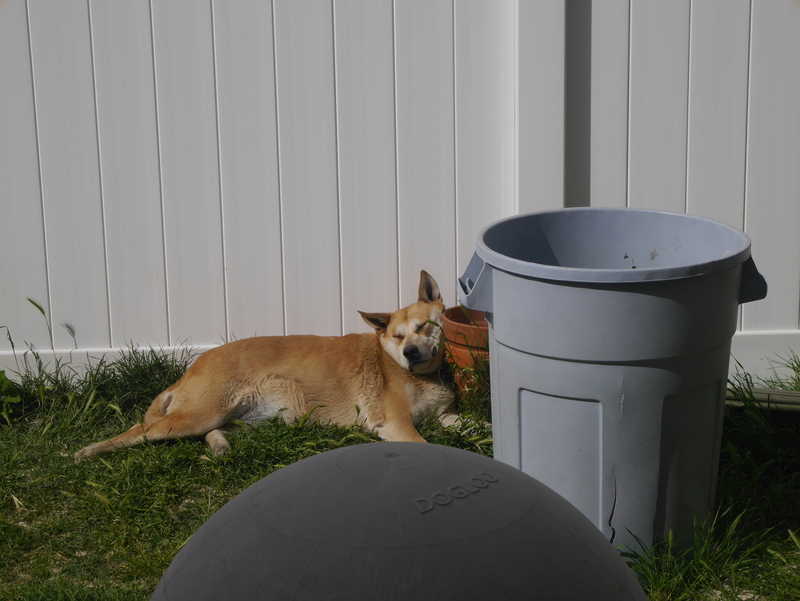 Chick, the dog, on the other hand, can’t fit into the pot of her choice so enjoys it in a sunny place along the fence. Funny. My feral cats don’t approach the pots, but sure love the cushions in the gazebo. Several years ago, when we had twelve strays we were finding homes for, there was one, huge orange striped tomcat that slept in the litter box we put out for them. It never got used because that cat was always sound asleep in it.